For many, the idea of opening a new bricks and mortar store would be a worrying prospect in the current climate, with stores small and large facing the pressures of a shifting retail landscape. This was not the case for husband and wife team Carl and Angel Drake however, who decided to open Rise Furniture and Mobility in Autumn 2017. Discussing his vision of delivering unparalleled local customer service, Carl talked to THIIS about the importance of getting an online and offline offer correct and his aspirations for the future. With over 35 years’ industry experience and having previously been the managing director of another retail brand in the market, Carl Drake is no stranger to the world of mobility. Starting life as a furniture designer for one of the UK’s largest furniture manufacturers, he was first introduced to the mobility sector when his company began working with house builders who were developing sheltered housing schemes and adaptations for kitchens and bathrooms. “We were designing and manufacturing some of the first fitted kitchens and bathrooms for disabled people in the industry. This led to the creation of a whole new division for the furniture manufacturer I was with at the time. That was my introduction to the industry,” said Carl. Over the years, Carl has worn many hats in the furniture industry, from designing the early fitted kitchens and bathroom for those with disabilities to importing luxury outdoor furniture from South-East Asia for clients including National Trust and prestigious sporting venues such as Lords Crickets Ground, as well as most County Councils across the country. His wife Angel, a retired nurse of 25 years and Rise Furniture and Mobility’s co-director, is also familiar with the industry, having spent many years working with vulnerable, elderly adults in social care and sheltered housing. It was whilst searching online and in store for products to help Carl’s parents, however, that the couple made the decision to bring together their comprehensive experience and knowledge to create a store of their own. “We found that we were spending more and more time online, looking at things for my parents and were getting frustrated by inferior products that were on the market. This was exacerbated by the inherent lack of understanding from sales personnel and their poor customer service,” said Carl. The experienced husband and wife team were confident they possessed the right knowledge and shared the same vision to offer the market a service that would not only meet their customers’ needs but actually exceed their expectations. 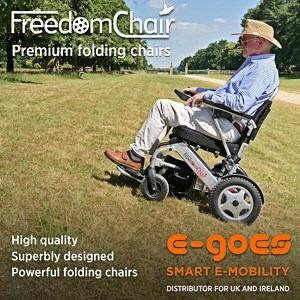 “We decided to open our own mobility showroom in my hometown of Harrogate with the intention of selling mobility products that I might buy for my parents,” continued Carl. It was this initial motivation to purchase products for Carl’s parents that formed Rise Furniture and Mobility’s approach to product selection and customer service. “We treat every customer the same way we would treat my parents, which I think makes a huge a difference when working in this industry,” he added. Selling an extensive range of mobility equipment including award-winning rise recline chairs and beds, stairlifts, scooters and daily living aids, Carl discussed Rise Furniture and Mobility’s method to selecting what products to sell in more detail. “Every customer has different needs,” he commented. According to Carl, Angel’s experience plays a pivotal role in helping the new retail store decide what products to place on its shelves. “From her time working in sheltered housing, Angel was all too familiar with her tenant’s buying patterns and what our customers may need,” he said. Alongside carefully selected products, Carl says providing excellent customer service is at the company’s core. “We want to provide a pleasant, relaxed shopping experience with the best possible customer service to our customers. It really is something that both Angel and I feel very passionate about,” emphasised Carl. Like many in the industry, Rise Furniture and Mobility offer home visits to customers, however, the retailer goes one step further by also offering a unique door-to-door service for local residents. “We understand that some prospective customers may have difficulty visiting the showroom or may be unable to get out of the house,” highlighted Carl. Offered free of charge and without obligation to purchase, the company says the service has enjoyed an amazing response in the local community and, in one case, even resulted in a life-changing moment for one of the store’s customers. “We had one lady come to the showroom who had been caring for her husband with dementia until he had sadly passed away,” Carl told THIIS. “After speaking to this lady over a number of phone calls, discussing her needs and gaining a better understanding of her situation, I invited her to our showroom so we could look at helping her. We are on her bus route, but she didn’t feel confident enough to get the bus and wasn’t really stable enough to make the journey alone. “I explained to her, that we could pick her up and bring her to the showroom, then afterwards take her back home. In the showroom over a cup of tea, I found we had a lot in common. She had grown up in an area I was familiar with. She told me all about her husband, eventually confiding in me that the visit to our showroom was the first time she had left the house in five years and that we had changed her life! The dedication to customer service seems to be paying off for the new mobility retailer, with Carl confirming that the number of repeat customers has been growing steadily since its September launch. “I think people really enjoy the experience and our unique approach. Seeing customers coming back proves we are doing something right,” he said. With consumers turning to online as their first port of call for products, information and services, Rise Furniture and Mobility invested heavily to ensure the online experience was able to match what the company was aiming to deliver in its bricks and mortar store. “Since 2011, the number of over-65’s shopping online has increased by almost 70 percent, so it was critical we got the website correct. Functionality and user experience is key,” commented Carl. “We wanted the website to appeal to someone looking for themselves, whom perhaps may be elderly and not so web savvy, but also appeal to a family relative; a son or daughter who is more familiar with online shopping and is looking on behalf of a parent or elderly loved one. Nominated finalists for Best New Website at the Harrogate Advertiser Business Awards 2018, the new mobility website has already received praise for its usability and content. Describing shopping for mobility products online for the first time as being a potential minefield, Carl wanted to ensure that the website was more than just a place to view products and was also able to offer customers guidance. With retail footfall seeing a steady decline over the past 12 months, it has been a testing time for many retailers across various sectors, leading many to question what it takes to be a successful retailer in the industry? For Carl, the answer is simple. “Honesty, integrity and transparency. Our “person-centred” approach helps us better understand the needs of our customers,” he stated. Another important element to Rise Mobility’s early success is its shrewdly selected store location. Situated in what is referred to as the bohemian quarter of Harrogate, the showroom is found on the busiest road into Harrogate from Leeds and is less than half a mile away from the town centre. Aiming to ensure the showroom maximises the benefit of the location, its shop front features a contemporary and fully on-brand design, with a modern slate grey and striking teal blue fascia. The large double fronted windows also make the entire interior one large window display. “The right location is absolutely key. We are opposite a church and in between a chemist and a Marks and Spencer’s food hall, so the location really is perfect and paramount to our success,” said Carl. It is the combination of all these various elements that leads Carl to believe his store can effectively compete against other established mobility retailers in the region and turn customers’ heads. “We are not trying to do what everyone else is doing and we want to be more than the average mobility shop. We don’t specialise in what I would call specialist medical aids and instead, the showroom is far more lifestyle-based,” stressed Carl. “We don’t think customers want to see shelves jammed pack with medical aids because it can be depressing. We think mobility, not disability and our customers like that. Instead, we’ve worked hard to create a showroom that is full of inspirational daily living aids and good ideas for independent living that make our customers’ lives better. With several award nominations already under their belt, a growing list of returning customers and rising revenues, Carl is optimistic about the future. “After such a fantastic start, the future looks very positive,” he said. “We are committed to growth and meeting the demands of the increasing, ageing population. Rise Furniture and Mobility is reinventing the shopping experience for the elderly or anyone struggling with mobility by selling products that people really want, rather than products they need out of necessity. The beginning for any new company is an exciting time, where the motivations for starting up are at the forefront of every business owner’s mind. Wanting to ensure their vision of offering best in class customer service constantly remains at the very heart of their business, Carl and Angel have made sure to embed their inspiration into their store and website so it is clear for every customer to see. “We stand by the sentiments of our mission statement. In fact, we’re building our reputation upon it. “It adorns our showroom wall and totally sums up what we are trying to achieve. It serves as a constant reminder of why we are doing what we are doing.